Melmerby is one of a small number of villages in the Eden area, that were supposed to have been laid out in such a way, that the houses surrounding the open village green, provided a protective barrier against cattle raiders, with Melmerby beck providing a suitable barrier on the open side of the village. Above. Old postcard showing the village green and church. Other villages in the area that share this claim are Askham, Temple Sowerby and Milburn, all within five or six miles of each other. Two nice post cards showing the castle pretty much as it is today. Here's the link to my previous post including quite a few photos and some information. Above. Post card (1900)showing the gatehouse, moat and Nithsdale hall. Above. Aerial photo showing the immense earthworks surrounding the castle. The Canmore website has some great photos of the castle, as well as loads of additional information. The Historic Scotland website also has loads of important information on the castle. 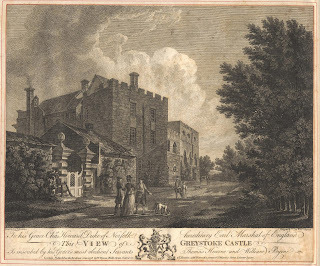 These are the only two postcards of Greystoke Castle I have so far. The post mark on the rear of the first card appears to show a date of 1925. This is the link to my previous post on Greystoke, along with the one single photo I managed to take. The official Greystoke Castle web site is also well worth checking out.